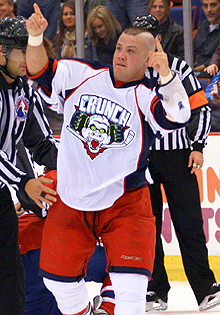 Jon “Nasty” Mirasty is one player you’d rather have on your team then to be playing against him. In his 10 year professional career which has seen him play all over the globe, he has racked up a total of 2571 penalty minutes. Case in point: He’s not one to be messed with. Jon Mirasty is a native of Meadow Lake, Saskatchewan and got his start in the WHL. He turned pro in 2003 with the Bakersfield Condors of the ECHL and the legend was born. I was intrigued by his style and his brief foray into the MMA world. March Hockey: You’ve played in numerous leagues but the one I’m most intrigued by is the KHL. How does the game over in Russia compare to that of North America?? Different atmosphere?? Jon Mirasty: Russia was a great experience. The game is a lot different. You play on a bigger ice surface which opens things up. On the physical aspect, guys there shy away from the rough stuff. Instead of booing, fans whistle. You don’t know if they are cheering for you or against you. It was very hard for me because I love to fight, and there I’d get into only 4 or 5 fights a season. All in all, it was a great time! MH: I’ll ask right off the bat too, who’s the toughest guy you’ve ever fought? JM: The toughest guy I ever fought is a pretty hard question to ask. I’ve fought so many guys that were very tough in different ways. Memorable guys that stand out to me would be guys like Steve MacIntyre, Derek Boogard, Jeremy Yablonski. I have to admit, Steve Bosse hit pretty hard too! But like I said, all the guys I fought were pretty tough and I respect them for doing one of the harder jobs in the game. MH: You’ve spent some time in the LNAH. How does that league compare to other ones you’ve played in? Do you think it’s changed since you’ve left? JM: I had a great time playing in the LNAH. Obviously the skill level wasn’t on par with the KHL or AHL, but I feel that a lot of people under estimate the league. From what I remember, there were some very good players, along with some very tough men. I love old school hockey but sometimes the fights/brawls got a little carried away. It was a very exciting league where fans got a little bit of everything. I haven’t played there in over 6 years so things may have changed. MH: Growing up as a kid, who was your biggest influence on your game and why? JM: A lot of people helped me get to where I got, but the biggest influence would have been my dad, Gary. MH: Any chance will see you in an MMA ring again?? What was that experience like?? JM: MMA was awesome. I have a lot of respect for those athletes. It is completely different than fighting on skates. I did not prepare properly and was not ready to compete. It takes a lot of devotion and time to train. With my new business adventures, I doubt I’ll have the time to ever attempt to compete again. I will train though. MH: If you could play (or fight haha) against anyone, past or present, who would it be and why?? JM: I’ve had great battles against many guys and would look forward to doing it again against any one of them. Let my son put a few years on, and maybe I’ll try him.